Powerful, evocative, and permeated with spiritual energy, 365 Blessings to Heal Myself and the World: Really Living One's Spirituality in Everyday Life by Pierre Pradervand is a spiritual gem, a compendium of blessings for every single day of the year, each opening up a portal into the soul of humanity, a fresh view of divinity, each an immersion into the gentle love that creates, heals, nourishes, and empowers us and the world around us. This book is the perfect tool that helps readers create a new consciousness of wellness and it is incredible in that it reminds readers of their power to utter blessings upon themselves and upon the world. It opens with a powerful blessing, one that speaks to me in a special way: “I bless myself sincerely and joyfully for being the utterly beautiful divine creature I am, at one with the Source of infinite Love.” Here is a blessing that reminds us of the beauty of who we are. While the blessings in this book allow us to speak healing and love into our human experience, they remind us of the power to transform life by developing an attitude that is God-like. In a world broken by evil, hatred and negative energy, Pierre Pradervand's writing reminds us that we are bigger than our pain, that we can transcend the darkness of our human frailty and rediscover the light of hope, that we can change perspective by communicating something positive in every day we live. 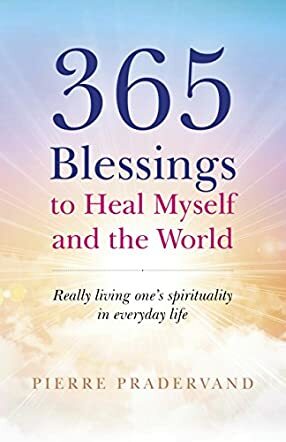 Pierre Pradervand's 365 Blessings to Heal Myself and the World: Really Living One's Spirituality in Everyday Life is a gift to be received with gratitude and to pass on generously.